Casseroles are a family favorite and this arroz con pollo recipe could very well turn into one that your family will want to have again and again. 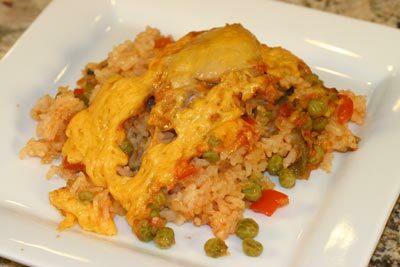 Arroz con pollo, which is also known as “rice with chicken”, is easy to make and a great dish for the busy mom or dad. It is also a great dish to bring to a pot-luck party. 6 chicken thighs, skinned (you can use bone in or debone thighs and cut into 1 – 2 inch pieces) I think it’s nice not to have to deal with bones in a casserole. Saute the onion in olive oil, starting on medium high heat. Reduce the heat to low once the onion starts cooking. Continue cooking, stirring frequently. After about 5 minutes add the bell pepper and saute for about 30 minutes until the onion is reduced to about 1/2 of what you started with and turns a golden brown. Add the garlic to the onion and saute an additional 3 – 5 minutes being careful not to burn the garlic. Stir constantly. Pour into a 9 x 13 oven-proof dish. Stir until everything is mixed well. Add the chicken on top and push it down into the rice mixture. Top with the grated cheese. Cover tightly with foil. Cook in a preheated *375 degree F oven for 1 hour and 10 minutes. Reynolds wrap has foil that is stick-proof and would work well with this recipe so the cheese does not stick to the foil. Test to see if the rice is done in the middle of the casserole. The ends usually get done first. If the middle is not done, recover and place back in the oven for another 10 minutes. Serve this arroz con pollo recipe topped with guacamole, flour tortillas and a salad for a complete meal. Click here to watch my Arroz Con Pollo video. Return from the Arroz Con Pollo Recipe to More Mexican Food Recipes.